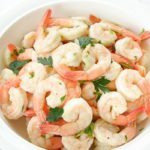 Shrimp Arnean is an easy to make and elegant appetizer. Your guests will be delighted with the fresh Mediterranean flavors infused in the shrimp. Put all ingredients together in a large bowl. Stir to combine. Cover bowl or put the mixture in a large plastic zip-top bag. Refrigerate overnight, stirring occasionally. Take mixture out of the refrigerator about an hour before serving (olive oil may have solidified in the refrigerator and this will get it back to a liquid state at room temperature). Pour the mixture into a large colander to drain. Pull out the shrimp and place them into a serving bowl. Discard remaining ingredients. Refrigerate leftovers. Cooked shellfish should be eaten within 2 to 3 days.